Tormenter prototype lure. We were in around 375 feet of water. Fishing for Wahoo is much like any other fishing, it is a bit of science, mixed with art, combined with a twist of instinct. There are many ways in which you can target this beautiful, fast, and tasty species. I will do my best to let you know them without making it sound too complicated. Of course, other fishermen will have their own ideas that may or may not be the same as my own, however, these methods will produce and you can use them with confidence. Getting local knowledge from a friend on how you may wish to add variations to some of these methods for best results in your area is always a good idea. The best way to target Wahoo in the Bahamas is finding a good spot where the ebbing tide flows from on top of the Bahama Bank into the deep ocean. It is here where hungry Wahoo will stake out and wait for baitfish to be swept unsuspectingly into the blue water. With a strong ebbing tide and the right time of year, catching trophy Wahoo is almost guaranteed. You can work your baits between 80 and 600 feet of water, but please know that Barracuda will mollest your baits often as you get into shallow water. The Palm Beach and Jupiter areas will also have hungry Wahoo waiting on the edge with a strong ebbing tide and you can sometimes find them in water as shallow as 75'. You can actually see the brown colored water moving into the ocean and turning North with the current making your fishing are easy to find. This would be the same in other areas that have the deep water close to shore and a large body of inland tidal water that will empty its contents twice a day. Wahoo will linger around boards and other things floating including Sargasm weed and will sometimes be in schools of more than 15 fish. 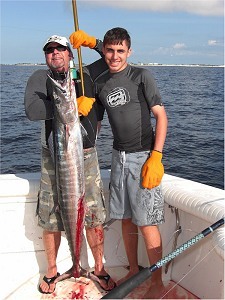 When fishing for Wahoo offshore, always look for floating debris and have baits out that will attract Wahoo. You can fish with live bait, lures, or dead bait. You can troll fast or as slow as 6 knots. If you catch a Wahoo off of debris or weeds offshore, ALWAYS repeat your moves and troll back over the same area until you either catch another or decide he was alone. Make up wire rigs with as light of wire as you feel comfortable with. Use Coffee Colored wire around #6 which will be around 55lb test. Rig a 6/0, 7/0, or 8/0 live bait hook with a similar sized treble hook trailing around five inches back. It is best to make these rigs only 2 feet long and use an Albright Special to tie it to some 80lb flourocarbon leader which should give you a leader length of between five and seven feet. No need for a super long leader as it is best to not have even an experienced wire man handle the leader (other than to guide the leader closer to the boat) as many people lose this fish because the wire man allows a bit of slack or uneven pressure. Of course, when trolling with cigar sinkers and long leaders you have no choice in the matter. Either hook your bait at the front in a proper method that will allow him to swim and breathe as you gently move the boat forward (to move in and out of deeper water), or use a harness as shown on the Live Bait Fishing Page. A simple harness can also be made of monel wire pushed through the forehead of the bait and twisted together tightly at the top of the forehead. Simply turn your 6/0 hook sideways to pass the tip and the barb between the fish and the wire. The hook should really point upwards when finished. b. Right Rigger - same as left. d. Right flat line - with 2 ounces of weight and around 80 feet of line out. a. Short Flat line - Fish Deep with around a 48 oz Cigar sinker (or more) on your shortest line. You can also use a large planer however, missed strikes can result. It should be only around 100 feet back. Fishing with braided line is suggested as it will get more depth than mono. Behind the large cigar sinker should be no less than 15 feet of leader and some people will use 30 feet. The leader should be made up of mostly mono or flourocarbon for stealth and the last bit of #16 wire or fairly heavy cable as nomatter the size of the Wahoo, he will not bite through it. b. Next flat line (#2) - Fish a little shallower with 16 ounces less weight and let your line out around 150 feet so that it will always stay above your short flat line and not get tangled. c. Flat line 3 - Fish shallower yet. This line should have 8 - 16 ounces less weight than #2 and should be deployed at around 250 feet also ensuring it does not tangle with #2 or #1.
d. Riggers - Fish them tight and low so they do not find their way into any of your deep lines on turns. These will be unweighted, however weighted lures can be used here if preferred. When trolling weeded areas, make sure not to pass your baits through weeds as reeling up a cigar sinker loaded with lead from 250 feet back is no fun. 3. Jigging for Wahoo - Find a current edge or flotsam as talked about above and plan to drift along that edge or flotsam while you deploy your favorite jigs. The amount of color and flash are always important and may possibly need to change from day to day for best results. Wahoo can be caught from the bottom all the way to the surface, but will usually be from the surface down to 60'. Drop your jigs to around 80' and work them up. Use Tormenter's CABLE RIGGED Jigging Hooks so you do not lose your fish. Lure Colors - Black & Purple, Orange & Black, Black & Red, Blue & White, Zuchini, Pink, Chartreuse, did I say Black & Purple? Your friend may have some other "secrets" to share with you. Live Bait - Blue Runner, Goggle Eye, Greenie (also known as Thread Herring), Cigar Minnows, Ballyhoo, Pinfish, Mullet, Bonita, Speedos. Jigs - Of Course Tormenter's will provide the best action and color selection required to catch Wahoo. See them at our Wahoo Lure page. Fish On - Getting him to the boat! When getting a Wahoo bite, the natural instinct is to reach for the throttles and clutches to pull back to neutral as it seems this fish will spool you in no time, BUT, DO NOT, I repeat, DO NOT follow your instinct. Instead, do not throttle back, do not slow down, do not turn the boat. If you are in a turn, straighten the boat out so as to take out any belly in the line. After, and ONLY after, your angler is settled and ready to fight do you slow down, but do not pull the boat out of gear. This is the single most common mistake when fighting a Wahoo that will cause you to lose the fish. After his initial run, 9 out of 10 times, a Wahoo will then swim straight toward the boat shaking his head violently. You must keep the boat in gear (and possibly above idle speed) to help your angler keep the line tight to make it impossible for the Wahoo to shake the hook. As the Wahoo is torpedo shaped, and pointed straight at the boat, there will be very little resistance given after he has made his epic run. Stay in gear and make sure your angler keeps the rod bent and UP. Yes, he can pump and reel, but do not let him point the rod straight at the fish as you want the flex of the rod tip to take out the shock of the Wahoo's violent shaking. This will greatly increase your chances of keeping him on the hook. It is definitely not neccessary to bring in the other lines unless you hooked your Wahoo on a line way back as his moves are predictable and if you keep the boat in gear and if your fish stays below your other lines, you should have no trouble, but if in doubt, reel them in. This has its own section as it is very important to know. First, do NOT pull the boat out of gear. Keep going straight ahead, usually at around 5 knots is best. When the fish starts to get close, have your angler move forward so that when the angler gets the leader to the rod tip and the fish comes to the boat, he will be along side the boat and not behind it. Teach your anglers this move when catching Tuna, Wahoo, Dolphin, and other pelagics. It will make you look like a true expert when it comes to landing a fish. With a Wahoo laying along side the boat, he is a perfect target for even the most inexperienced Gaff Man. While keeping the boat moving ahead, as the angler gets the fish to where his head is forward of the transom and in front of the Gaff Man, the Gaff Man can then easily reach over the fish with the gaff and steadily pull the gaff (with the hook pointed downward) until the fish is over the gunnel and in the boat. If you are using a transom fish box, I STRONGLY recommend that you land the fish on the deck, get full control of him, and then place him in the box. Don't forget to ice him down as soon as you get the cockpit settled and any lines back out. If you have caught your Wahoo on a trolling rig with a long leader and a wire man is needed, the wire man needs to pull gently and quickly enough to keep the fish from swimming faster than the retrieval of the leader. It must be a smooth motion and you MUST be ready to land the gaff as soon as the Wahoo is next to the boat. If you are not ready, and do not sink the gaff as soon as the fish is next to the boat, your chances of getting him in the boat will decrease rapidly. If a Wahoo is caught trolling with a 8/0 hook or larger, I can almost guarantee that 50% of your fish will have the hooks fall out after landing on the deck. This is why it is so important to keep the boat moving ahead and use the rod tip to absorb shock. Gaffing any fish (other than a bottom species) behind the boat is not a good move. Only do this when a fish will not come along side. to find excellent lures for attracting Wahoos to visit your transom.